School surfacing is a vital part of the infrastructure of a community’s centres of education. Whether a child is at pre-school, primary school or a teenager at a secondary school. Playgrounds are important social and communal spaces. Being part of the school community is more than just learning inside the classroom. Spending time outside and enjoying spells of free playtime throughout the day is scientifically proven to benefit health, social development, and aid concentration and learning within the classroom too. 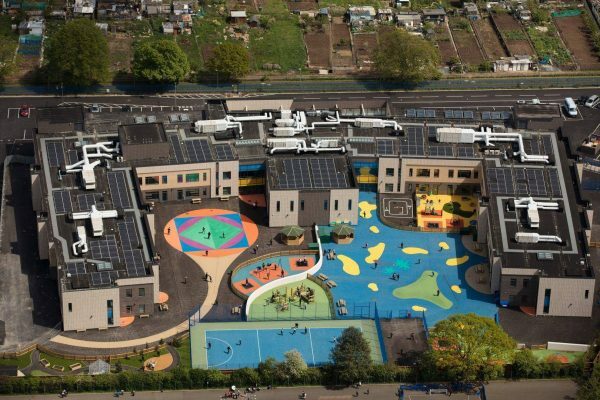 NatraTex school surfacing materials have been specified by architects for the external landscaping of new schools across the UK. Local authorities looking to regenerate existing school playgrounds, footpaths and MUGA’s draw upon our extensive experience and fantastic product range. Fossebrook School was a newly built primary school in 2016 on the outskirts of the city of Leicester for Leicestershire County Council. The school’s simple layout aids pupil orientation, with all classrooms overlooking the play areas and sports pitch. This made the choice of school surfacing of vital importance within the plan and build. NatraTex Cotswold and Grey created the important link between the building and the school grounds, combining stylish colour and durability. Marjory Kinnon Special Educational Needs School’s new two storey building and grounds were designed by Pick Everard for their client, The London Borough of Hounslow. NatraTex supplied Northern Irish construction contractor Farrans with a broad palette of porous school surfacing materials for playgrounds and MUGA’s as part of this £30 million development. The outdoor space is a fun and stimulating environment to meet the complex learning needs of SEN pupils in the West London area. Further details of NatraTex specifications can be found in our FAQ’s. If you are an architect, contractor, or local authority and would like assistance and a quote for your school surfacing project, please contact us.